This Article explains about the all the advanced layouts of android widget placement. This layout is used to add views in a stack format, one item over another. The position of items is set using android:gravityattribute. The size of the layout depends upon the size of the largest view. The most recently placed view is placed over older views. In the preceding markup, three image views are added to the frame layout. To position the images android:layout_gravity default, the images are positioned at the top left of the layout. To position the second image at the bottom of the layout, the attribute, android:layout_gravity="bottom",has been used. In a frame layout, the last added item is always at the top of other items. 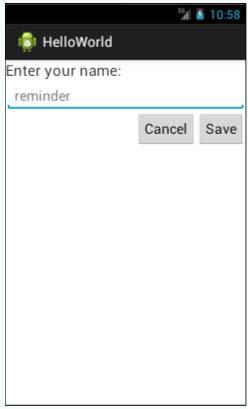 The EditText widget is added at the bottom of the TextView widget, as specified by the following attribute: android:layout_below="@+id/textView1", Also, the left and right edges of the EditText widget are aligned with the left and right edges of the TextView widget, as specified by the following attributes: android:layout_alignLeft="@+id/ textView1" android:layout_alignRight="@+id/ textView1"
android:layout_toLeftOf="@+id/ button1"android:layout_alignTop="@+id/ button1", android:layout_alignBottom="@+id/ button1"
If you want to specify the exact position of views on a layout, you can use the absolute layout. Absolute layout is not recommended because you may not want to develop an application for a specific screen resolution and size. This layout is the least flexible among all the available layouts. For example, consider the UI in the following figure. 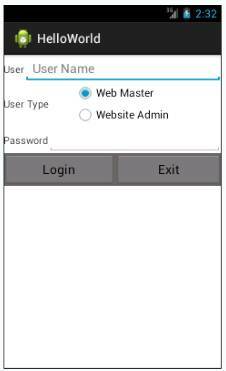 In the preceding markup, the TextView widget is added at position specified by the android:layout_x="44dp"and android:layout_y="69dp" attributes where 44dpand 69dpare the positions of top left corner of the TextView widget. 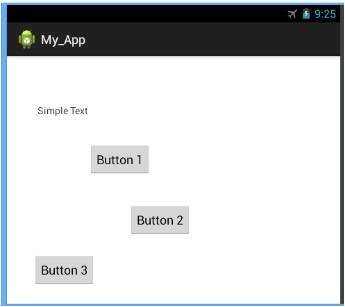 Similarly, all other elements are placed in absolute positions using the android:layout_x and android:layout_y attributes. To create this kind of UI, you need to use different layouts for different parts of the interface. These layouts can then be nested inside another layout. This is all about the layouts of androids. 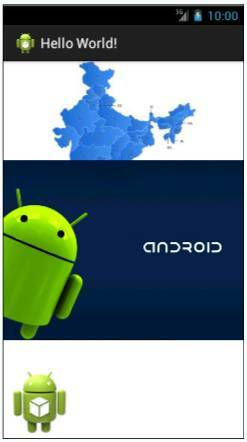 All together androids have Frame Layout, Relative Layout, Absolute Layout, Nested Layout, Linear layout & Table layout. My next article will come up with more interesting implementation of androids.